Academy Dental’s annual Dentistry From The Heart event was on April 25th, where we provided free dental care for the whole community for an entire day. It was a great success, and we are thrilled to announce that we provided over $39,000 worth of fillings, extractions, and cleanings! Our main location on Fort St. in Victoria did $27,104.80 and our Sooke location did $12,263.42. Dentistry from the Heart, which began in 2001, has grown to become a worldwide nonprofit organization dedicated to providing free dental care to those in need. 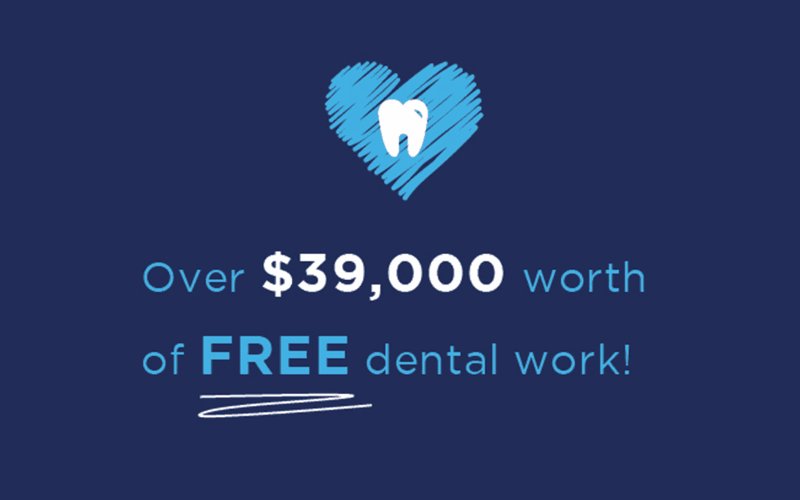 Every year, thousands of individual dentists, hygienists, volunteers, and hundreds of practices across the world donate their time and resources to host their own Dentistry from the Heart events, giving millions of dollars worth of free dentistry to those who cannot afford it. This is just one way Academy Dental is trying to make dentistry more accessible, as it falls outside of the Canada Health Act, making dental care out of reach for many Canadians. We’d like to thank everyone who came out for helping us give back to the community, and we’d also like to recognize and thank our amazing sponsors for their continued support as it would not be possible without them. Our sponsors are Patterson Dental, Thrifty Foods, Romeo’s, Red Barn Market, Freeflow Coffee & Water, Royal Bank of Canada, E-Madill, Subway in Sooke, Canadian Linen, DENTSPLY, Doug Thorsteinson (for musical entertainment), David Simms (for Blood Pressure and food services), Island Farms, and Reinert Peterson at 100.3 the Q! Academy Dental Victoria is located at 1195 Fort St. Victoria, V8V 3L1. Academy Dental Sooke is located at 6689 Sooke Road, Sooke, V9Z 1A5. Give us a call today at (250) 385-6552.